Little is known about this company, in spite of the fact that they were one of the major manufacturers of panther TV lamps. Jacquelin's use of ink-stamped markings applied over the final glazed surface is largely responsible for their anonymity, as the delicate markings are typically illegible today. The three designs shown below are the only ones that are confirmed Jacquelin products. 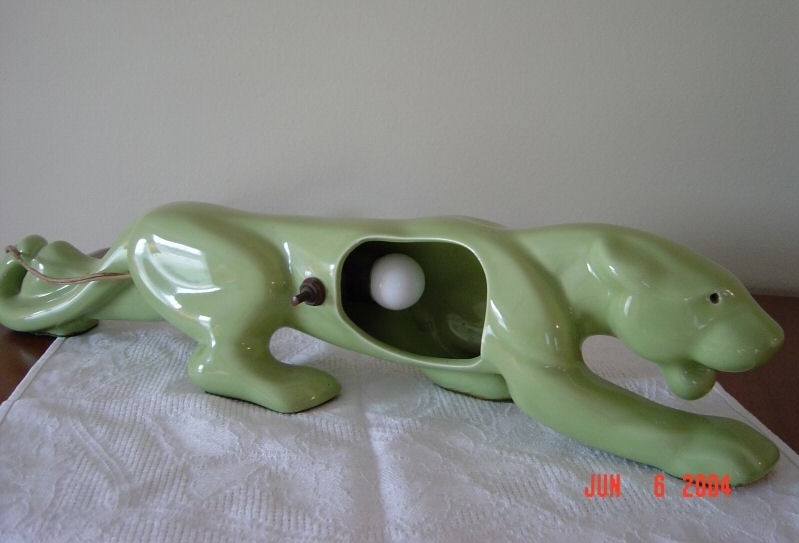 Their panthers are a powerful icon of the '50s, and are the very essence of tasteful TV lamp design. The classic stalking panther. This one can also be seen from the back. The Jacquelin panther has escalated greatly in value recently, suggesting that these TV lamps are beginning to get their due. 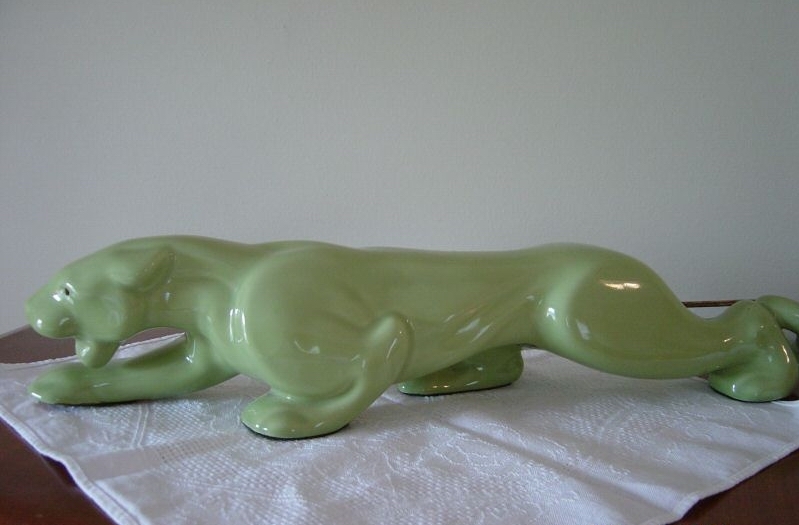 They are virtually identical to a panther figurine by Haeger Potteries, but Haeger doesn't appear to have made a TV lamp version. It's found in several colors, black being the most common. Photos courtesy of Andrea from USA. This is a close-up of the underside of the Jacquelin panther showing the manufacturers mark. It reads, Model 522 Jacquelin Panther "TV" lamp. This mark wears poorly, and legible markings on these are rare. A less common foil label is occasionally found on Jacquelin panthers that reads Crafted by Jacquelin Fine Vitrified China. 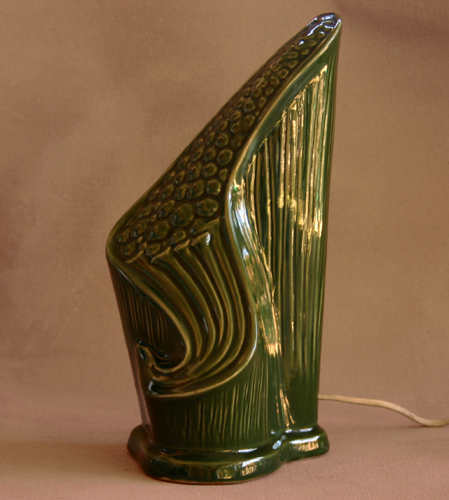 It was pointed out to me by Bess W. Metcalf from The Sneaky Kitchen that this Jacquelin TV lamp might represent a harp. I've always thought it was a cornucopia of some sort, but perhaps we should just consider it a fanciful abstraction. 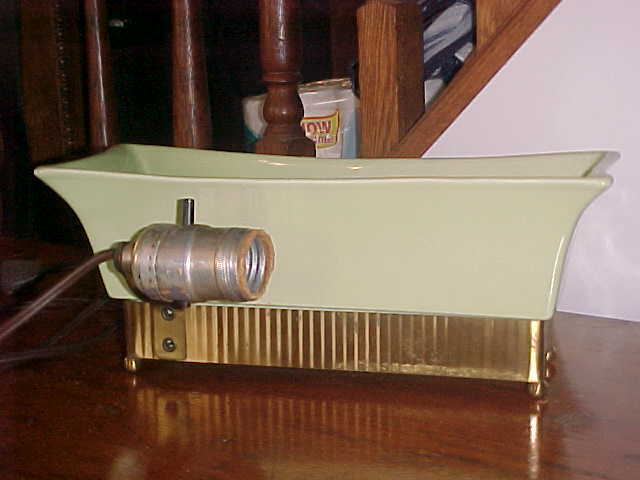 I've seen an example of this one that has a label on the back that reads, Model 310 Jacquelin "Capri" Lamp. It can also be found in maroon or green. 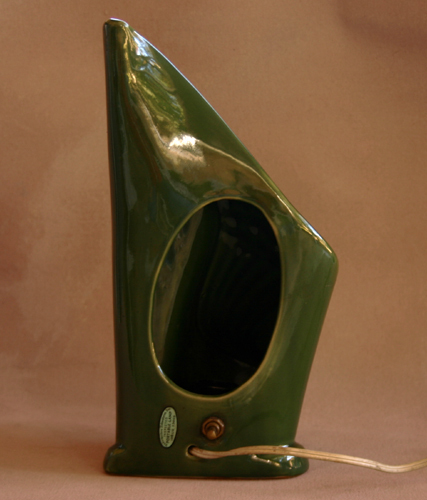 Here's the green version of Jacquelin's Capri Lamp. 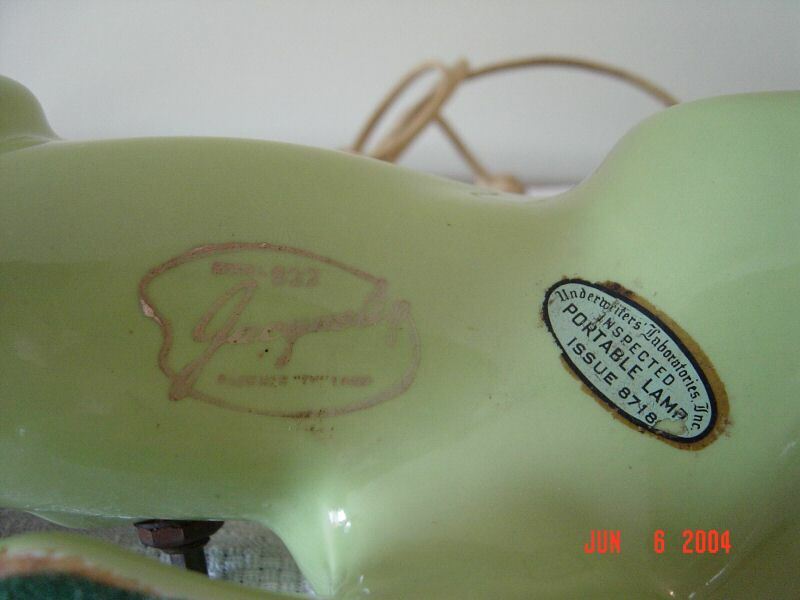 While basic planter/lamps were often sales leaders for the various manufacturers, this Jacquelin planter is seldom seen. Photos courtesy of Laura Keltz. 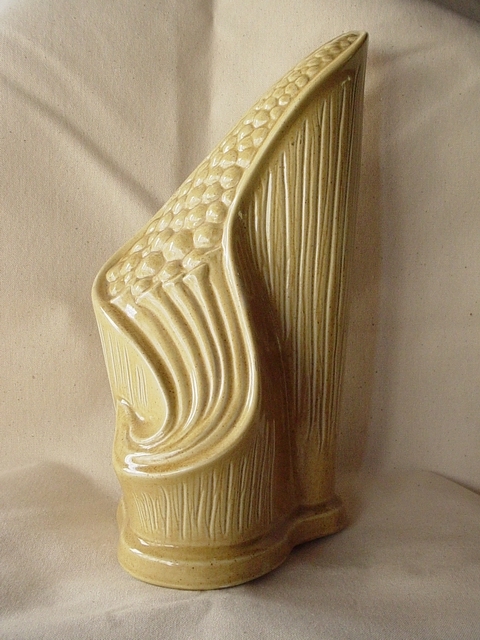 Back view of the Jacquelin planter/TV lamp. 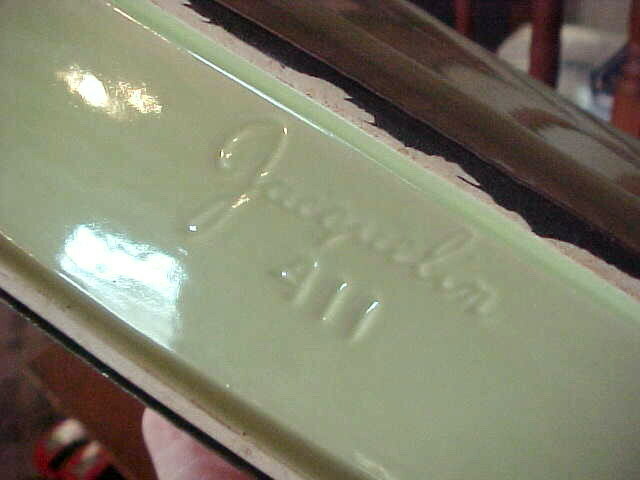 The Jacquelin marking is clearly seen on the base of their planter, as is the model number, 411.